Osella is an Italian racing team whose roots go back to founder Vincenzo Osella racing Abarth cars in Italian hillclimbs in the 1960s. He began building cars under his own name in 1974 and the first Osella car (which was actually an F2 racer) was entered in Formula One in 1980. A full factory effort would also be undertaken that season. In 1983, Osella featured factory Alfa Romeo race engines. This one’s a 3.0-liter V-12 and this car was raced by Piercarlo Ghinzani. It’s only race finish was 11th at the 1983 Dutch Grand Prix. It has been owned by Ghinzani since and has been completely restored and is more or less ready to go. It should sell for between $150,000-$200,000. Click here for more info. 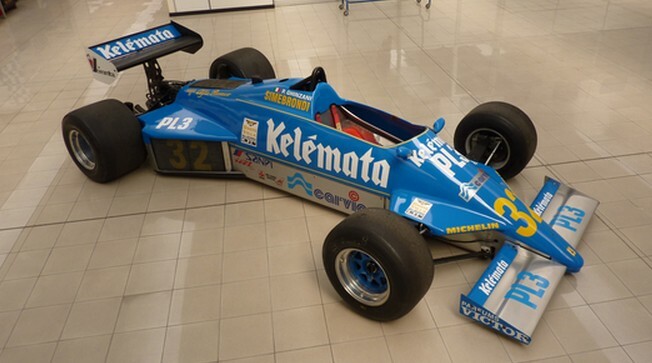 This entry was posted in Uncategorized and tagged 1983, alfa romeo, auctions, cars, classic cars, f1, fa1e, formula one, osella, race cars, silverstone auctions by classiccarweekly. Bookmark the permalink.